4-section melamine plate approximately 8.5 inches by 7.75 inches. Plate has 3 main sections. Large section on the right has a small raised divider to create 2 sections (approximately 2/3 and 1/3 of the right section). 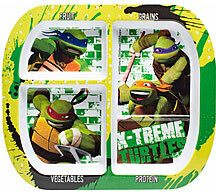 Great for little fans of Ninja Turtles. Also great for keeping the food on the plate.